The customer was evaluating switching regulator power management strategies in a portable wireless application. Cost, performance tradeoffs were to be evaluated in the customer load environment. 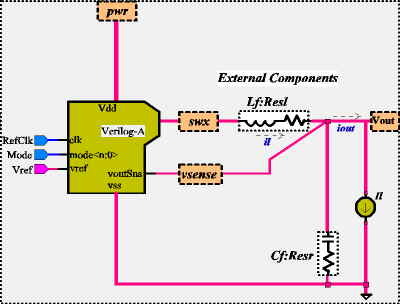 Since switching regulators require large amounts of simulator bandwidth, constructing physical circuit schematics was rejected and a Verilog-A model was coded for the regulator function. Five different control approaches were implemented and tested in the customer load environment. Simulation time per simulation evaluation cycle was minutes, not days. Beyond simulation time improvement, the ability to experiment with system design approaches by changing a couple of code lines rather than schematic components was a important benefit. After customer sign-off of the system model, the physical circuit schematics were generated and top level simulations were run to verify the design. Simulation cycle time for the specification parameter verification using the physical circuit design required 6 days. The simulations results(physical/model) were compared and found to be nearly identical. The value of Verilog-A system modeling was proven and the customer was happy with the first pass silicon.